Access the online Africa Bibliography here. This large and authoritative guide to works in African studies has been published under the auspices of the International African Institute annually since 1984. It was fully digitised in 2011. 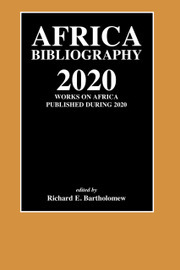 The Africa Bibliography includes a wide range of material: monographs, chapters in edited volumes, journal articles, and pamphlets. It covers all regions of Africa, including North Africa. It lists works published in English as well as a number of other languages: Portuguese, French, Italian, German, Swahili, Spanish and Afrikaans. The bibliography categorises by region, country and subject. It includes an author index and a detailed thematic index. Publications principally in the social and environmental sciences, humanities and arts, and some items from the medical, biological and natural sciences are recorded. The bibliography includes materials on Africa published in non-specialist scholarly journals, in addition to specialist Africa publications. As an annual publication, it records the previous year's published work in its field, with provision for retrospective inclusion of earlier items. It is prepared in association with the International African Institute's journal Africa.